The discovery of the Howie Wing transcriptions can be largely attributed to bad weather and dumb luck. In February of 2005, Los Angeles was having one of its rare wet and dreary winters. Generally Northern California is much more prone to cool, damp and glum days, but this year the reverse was true. So, when my husband, and I went up to San Francisco on business, we decided to make an extended weekend of it. That plan included a visit to Sacramento. In Sacramento, we stopped in Old Town, a partial preservation and re-creation of the original gold rush era Sacramento on the shores of the lugubrious Sacramento River. There we wandered covered boardwalks leading into many interesting shops and restaurants, one of which turned out to be a vintage record store. The dark, dusty shop was a rabbit warren of rooms all bumping up against each other. As we meandered we noticed a small room at the back, something the size of a large closet. This room had a faded and slightly skewed sign on the wall that read, “78 Room.” In that room were haphazard stacks of dusty records, as well as records of many sizes tacked to the wall; one on the wall was a 16-inch transcription. As a fan of old time radio, I couldn’t’ resist a closer look. I pulled the record off the pushpin it was hung upon. The light blue label told me it was a set of commercials for Kellogg Bran Flakes. I looked around to see if there might be other 16-inch discs. A glance toward the opposite side of the tiny room revealed another oversized record, this one in an aging dust sleeve. The dim lighting in the room made it difficult to read the black printing, which was in low contrast to the red background, but I could make out the phrases Howie Wing and World Broadcasting System, along with the words Vertical Cut. By squinting a bit, I also saw a copyright date of 1938 and a program number of 82. After a careful search through different sized disks stacked haphazardly on a table, two more similar records came to light, but with different episode numbers… so now there were three two-sided disks of Howie Wing. I’ve listened to a lot of old radio shows over the years, but had never heard of Howie Wing, but the disks weren’t expensive, so I took a chance and purchased those three, plus the one with the commercials. Once back home with the disks, I had no idea what to do with them. I didn’t have the equipment to play them, so the Internet was an obvious starting place to find information. One of the first things I found was a reference to an advertising blitz Kellogg’s used to promote the Howie Wing show. From this initial Internet search I learned that Howie Wing was a 15-minute juvenile series that ran from 1938-1939 and that it had to do with the adventures of a young aviator at a training school. The 21-year-old hero of the series was, as you might suspect, a cadet named Howie Wing. In the quest for additional information I also contacted a few people I knew from various Yahoo Old Time Radio (OTR) groups. One of them, George Hughes, didn’t know the series, but suggested someone who might be able to play the recordings. Unfortunately that person was not in the USA, and I didn’t want to risk the transcriptions by putting them in the hands of the postal system. Yet, without someone with the equipment to play them, we couldn’t verify what was on the recordings. So, it was back to the Internet, where I found an article entitled Keep ‘Em Flying: Radio Aviators by Jack French. 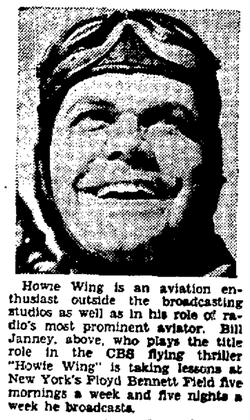 In the article Jack mentioned Howie Wing as one of a series of aviation related radio shows popular in the 1930s and 40s. He also noted that no episodes were known to have survived to present day, and the series was considered 'lost'. This, of course, was extremely exciting information, as it sounded as though I did have something that might be of keen interest to the OTR community. Fortunately there was an email address for Jack and with his readily offered assistance we (mostly Jack) rapidly came up with a plan. Jack is a man of resources and resourcefulness. Within a few days he put me in touch with Jerry Haendiges, who lives less than an hour from me, so I didn't have to risk mailing the transcriptions. Jerry has a lot of electronic toys, and knows how to use them. Not only does he have the skill to coax sound out of nearly extinct recordings, but he also has a genuine love for the work of preserving old radio shows. With Jerry’s help, we listened to one of the 15-minute episodes that day. Even though the recordings were dirty and worn and we had to strain to hear the action through quite a bit of snap, crackle and pop, it was a magical moment! Jerry Haendiges (center), a sound engineer and OTR dealer in Los Angeles listens to a transcription disk with Kathy and Jim Hammel as they become the first three people in over 65 years to hear a recording of radio's "Howie Wing." The announcer came on and said (in slightly muffled tones), "Stand by for Howie Wing, a Saga of Aviation!" I was entranced. I’m not sure I really attended to the actual sequence of events being played out in that episode; I was so totally enchanted by knowing this was the first time in almost 70 years the recording was being heard. Realizing that we were also listening to something considered lost, but now found, added immeasurably to the elation of everyone in the room. With the confirmation that the disks did, in fact, contain episodes of a previously lost series, things moved rapidly into high gear. Jerry kept the recordings to work his digital magic on them; Jack, like a general commanding troops, went on to marshal an amazing force of people in order to get the word out about the find and to see what else we could uncover about this series. Jack contacted Jim Widner and a few other folks to announce the discovery through various OTR lists and websites, and alerted several researchers, including Karl Schadow, to keep an eye out for references to Howie Wing. Jack also ransacked his own research files to drag out every little reference he had to the show. With Jack’s troops on the job, information started pouring in. One of our first finds was the date of Howie Wing’s debut. Contrary to all published information that indicated the show was on the air from October 1938 through June 1939, both Jack and Karl found references that proved the show had an earlier season. One such confirmation was a New Show ad from a February 1938 edition of The Los Angeles Times. 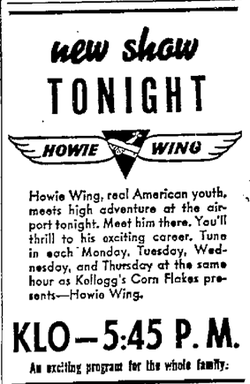 The ad invited radio listeners to "Tune in each Monday, Tuesday, Wednesday, and Thursday at the same hour, as Kellogg's Corn Flakes presents -- Howie Wing"
With veteran OTR researcher Karl Schadow on the trail, we rapidly came up with additional leads. Within short order, Karl had delved into the Library of Congress (the United States of America’s national archives) where he found information that further confirmed Howie Wing ran for two seasons and that there were two different advertising agencies involved in its production. The NW Ayer & Son agency noted on the label of the recordings we had, and J. Walter Thompson. Karl also found out that the second series (October 1938-June 1939) was broadcast coast to coast by the Columbia network and various affiliates. We couldn't tell, from what was on the label, if our transcriptions, with their copyright of 1938, were from the first or second series, but later were able to determine that the 6 episodes found in the basement shop were from the first season. Finding out that J. Walter Thompson was the ad agency for one of the series was a major boon to the research efforts. Karl knew that the J. Walter Thompson Company had donated its archives to Duke University, and Duke told Karl they actually had Howie Wing scripts on microfilm. Karl, who thankfully lives near enough to drive to both the Library of Congress and Duke University, immediately began planning a trip to visit the archives. One thrilling find during Karl's initial visit to the Library of Congress was yet another transcription of the show, one more 15 minute episode! This one was from late June 1939 and was the last show recorded of the second season. Karl was able to track down who we believed the copyright holder might be, and he obtained permission for the Library of Congress to make a copy of this for the research team, but unfortunately we were not permitted to release the episode to the public. By listening to the Library of Congress recording, we knew that a third season of Howie Wing was planned. At the start of the episode, the announcer told the young listeners Howie and friends would be back in the fall for further adventures. However, at that time we found no further evidence of a third season, at least not anywhere in the United States. By the time the research team had put together Karl’s notes from the Library of Congress, we’d learned that the show was probably also aired in Canada. Karl and Jack both found clues that there were a number of Howie Wing premiums put out by Kellogg’s, the show’s sponsor and a number of those seemed to be made in Canada. There was also a somewhat obscure reference to a possible Australian run of the show. I mentioned earlier, that when I first began to look for help identifying what the transcriptions were, I’d talked to another Old Time Radio fan named George Hughes. At that time, George suggested someone who could play the transcriptions, but that person was not in the USA. It turns out, the fellow George tried to refer me to was Ian Grieve, of Australia. As soon as Karl mentioned a possible Australian connection for Howie Wing, I thought of Ian, who is also a member of some of the same Yahoo OTR groups I belonged to. I knew that Ian is an avid collector/researcher and preservationist of Australian old time radio shows. If anyone would know about a possible Australian version of Howie Wing, Ian would be that person. Ian belongs to a dedicated network of like-minded preservationists in Australia, and he immediately put out feelers. Within a few hours he confirmed that Grace Gibson had brought Howie Wing to Australia and, rather than doing an Australian remake of the show, the American shows were the ones that were broadcast there. From Ian’s information we learned that the series ran, in Australia, after it appeared in the USA. Coincidentally, at just about this time, I’d noticed, on a popular auction site, that a 1939 Kellogg’s cereal premium for Howie Wing had been up for auction by an Australian seller. That item had been purchased by an Australian bidder. I mentioned this to Ian, and, by luck, I’d saved the auction information. With that information, Ian was able to track down the buyer. takes time to research the items in his collection. Tony was quite a fount of information about the show. Tony was aware that Howie Wing had also been very popular in Canada. This pointed us back to an earlier lead from Karl that I hadn’t followed up on, but now, in our quest for more information, we looked toward Canada. Ian recommended an acquaintance, Archie Hunter, a Canadian OTR fan and researcher who I also knew about from our Yahoo OTR groups. I emailed Archie and Archie was ready, willing and able to assist. He contacted some local radio stations and visited the Canadian National Archives. He confirmed that the show was heard and popular in Canada, and found proof that Howie Wing arrived in Canada a full two weeks earlier than he did in the USA. Archie found, as well, some Kellogg’s premiums that were made in Canada. Then, at the Canadian National Archives, he found, and listened to, one more episode of the show! So then, we knew about 8 surviving copies. Things were moving pretty quickly. Ian says that this is a ‘lucky’ series. It certainly seems like the spirit of Howie Wing has been guiding us on this journey. I found the transcriptions in the middle of February 2005. By the end of that month I’d found Jack and Jack had brought in Jerry Haendiges and Karl Schadow. By early March 2005 we had quite a bit of solid information and had located another copy of the show at the Library of Congress, plus, Karl had learned about the Duke University archive of the J. Walter Thompson Company, and Duke claimed they actually had scripts for the show on microfilm. By early April 2005, Ian was firmly on board, and Archie had joined us. We’d also found Tony, the premium collector, who offered us a lot of detailed information about the advertising campaign. Tony has an amazing variety of premiums, including handbooks and other items from something he called the Howie Wing Club. He has full-page ads for the show, and articles from the Australian radio guide, Wireless Weekly. The articles in Wireless Weekly were (purportedly) written for the youngsters by the “Commanding Officer” of the Australian Howie Wing Club WW I ace, Lt. Robert MacKenzie. (The Howie Wing Club is also known as the Cadet Aviation Corps, in North America, and the Aviation Cadet Corps in Australia). Lt. MacKenzie, I believe, was part of the squadron that brought down the historic German ace known as “the Red Baron”. He also was involved in early airmail flights in Australia. The articles Mackenzie wrote for the Wireless Weekly consisted of a series of flying lessons. These flying lessons outlined how an airplane worked. Also through Tony we found out that the US had a similar role model for the American version of the club. In the US, Captain James H. “Jack” Knight, who had been a military flight instructor during WW I and a rather famous airmail pilot after the war, was the designated “Chief Pilot” for all the young American and Canadian “cadets”. While we’ve had some trouble finding much information about Lt. Robert MacKenzie, the Internet is full of tributes to Jack Knight. His main, and much deserved, claim to fame is his daring 1921 night flight across the American plains during a blizzard to ensure that the mail was delivered in the first-ever, coast to coast, overnight flight. Due to his epic flight, in an open cockpit biplane, airmail delivery was proved viable, and the US government agreed to continue subsidizing the fledgling industry until it could finally grow to be self-supporting. There’s even a 1950s children’s book, Pilot Jack Knight, which gives an account of this courageous man’s life. We also learned, through our early research that, in the USA, the first series was on 4 days per week (Monday - Thursday), and the second series was on for 5 (Monday-Friday). While information seemed to be pouring in from all sides, we still had many questions. One of the most burning for me was: Why wasn’t there a third season when the show appeared, to all intents and purposes, to be flying high in three countries on two continents? We finally found, via the New York Times online newspaper archive, the reason why there had been no third season. Howie Wing was the work of one writer, Willfred (Bill) Gibbs Moore. Captain Bill Moore had been a WW I ace, much like MacKenzie and Knight. Howie Wing was based, in part, on Bill Moore’s experiences as a young pilot during wartime. Those of you who are fans of The Air Adventures of Jimmie Allen and Captain Midnight might recognize the name. Moore, along with sometimes writing partner, Robert W. Burtt, created and authored those shows. It appears, however, that Moore soloed for Howie Wing. The article on Bill Moore that I found in the New York Times Archive was, sadly, an obituary. In July 1939, right after the second season of Howie Wing wrapped, Bill Moore dropped dead suddenly from a heart attack. He was only 42 years old and left a wife and four school age children. We thought that was the end of the story. Imagine our surprise, two years later, when we found yet another transcription disk with two more episodes on it that were recorded AFTER June 1939, at which time the American broadcasts had ended. The episodes, which were part of a Canadian-only third season, ran from September through November 1939. They were broadcast in Canada and only aired in Canada, with a largely Canadian Cast. We have very little information about this season, but believe, based on correspondence Karl found in the Duke University archives, that William Janney, who had played Howie during the second season, was kept on. It doesn’t appear that any of the other cast members stayed with the show and we’re not sure who wrote the scripts, so here is another area ripe for research. Prior to the discovery of the fourth Howie Wing transcription, Karl had headed down to the J. Walter Thompson Archives at Duke University (May 2005), and found 195 scripts from the second season (all of them!) and 10 from the first series that had been produced by NW Ayer and Son. This helped us to verify that the transcriptions I found were from the first series and that the one Karl located in the Library of Congress was indeed the last show broadcast in the US. Also in the Duke University’s J. Walter Thompson archive we found a contract between J. Walter Thompson agency and Janney showing Janney was contracted in April of 1939 to play Howie (from July 3 through September 18, 1939), but with production moving from New York, to Toronto. There’s also a letter from J. Walter Thompson indicating that Neal O’Malley was invited to continue in his role as Captain Harvey. A later letter tells us that O’Malley declined the option, writing that he was considering leaving acting. A month after Moore’s death, and 6 weeks after the third season of the show was originally scheduled to begin, J. Walter Thompson sent a letter to Janney asking for an extension on his option. A letter from Janney, dated a week later, declines an extension of his option for US shows, and mentions that he was not contracted for a set of shows to be made solely for a Canadian audience. We don’t know how this altercation was resolved, but believe that Janney did finally agree to play Howie in this final Canadian-only season. With Moore out of the picture, we’re not certain why Kellogg’s decided to go forward with Howie Wing, and why only in Canada, leaving the US fans to find their audio adventures elsewhere. Even with this material, some of us were sceptical that the planned Toronto season was ever made, but with the discovery of the 3rd season disks, and some subsequently located Canadian radio schedules for the fall of 1939, we had proof positive that it had been. Additionally, included in the materials Karl found at Duke University, were second season payroll sheets, from which we were able to determine many of the cast members. The first airing of some version of Howie Wing appears to have been in early 1937. The show was first brought to the air by independent radio station president and entrepreneur Don Davis and was only locally aired in Kansas City, Missouri on Davis’ station, WHB. Very little is known about the show when it was produced in Kansans City. It’s not known who the actors were or if the scripts were the same ones used in what we herein refer to as the “first season”. To our knowledge, no recordings from this local series have survived. The scant information we have comes from a few lines in trade magazines that mention the sale of the series to sponsor, Kellogg’s. We’re considering this unknown set of shows as a local effort, rather than viewing them as part of the more widely distributed seasons that were sponsored by Kellogg’s. We do know that Kellogg’s purchased the series from Don Davis, and also obtained the services of the writer/producer, Bill Moore, by December of 1937. Davis was Moore’s agent. He came from an advertising background, but showed a decided interest in the then fledgling radio business. Due to his skill as an ad agent, and his interest in radio, he was tapped to be the president of the independent Kansas City, Missouri radio Station WHB in 1931. It was largely due to his efforts that Howie Wing went from a local adventure to a coast-to-coast hit. In selling Howie Wing, Davis traded heavily on Moore’s background as renown pilot as well as on Moore’s proven writing skills, based on the hit series, The Air Adventures of Jimmie Allen, which Moore had co-authored with Robert Burtt. Davis’ promotional material for Howie Wing, A saga of Aviation called it Educational, Inspiring and Character Building… the Aristocrat of Radio Aviation Serials. Appealing to Boys, Girls, Men, Women. Davis packaged the show as built for five quarter-hour broadcasts a week… Priced as a package complete: including script, production, cast and master recording or network performance… A natural for cereal, candy, soap, toothpaste, gasoline, food or health products…” Davis didn’t exclude much. And, Moore came with it as producer as well as writer. With the children’s show Singing Lady and Kellogg’s parting ways at this time, Kellogg’s needed something new that was “educational, inspiring and character building, to replace that long running staple among the younger set. Howie Wing seemed a natural fit. Kellogg’s purchased the show in December 1937. By January 3, 1938 they had signed contracts between NW Ayer & Son (ad agency) and World Broadcasting System, who would cut the transcription disks. By January 30th, the show debuted in Canada and two weeks later on selected US stations. Kellogg’s aired its first season of Howie Wing from Chicago, with a Chicago based cast. The shows were transcribed by World Broadcasting System and were distributed to Canada starting on January 31, 1938, then to select stations in the US starting February 14, 1938. At this time Kellogg’s was also sponsoring some Baseball broadcasts, so Howie Wing was only distributed to areas that did not offer those other shows. The stations where Kellogg’s placed Howie Wing were primarily in the Western US States, broadcast over the Mutual (Don Lee) network. We know, through documents in the J. Walter Thompson archive at Duke University that 104 transcription disks were planned. We don’t know if all 104 episodes were made, or if more than 104 were completed. We do know that at least 84 episodes were made, as the episode numbers found in that vintage record shop were Numbers 77, 78, 81, 82, 83 and 84. Thus far, these are the only season one episodes know to have survived. The promotion and advertising for the better-known second season of Howie Wing was handled by J. Walter Thompson ad agency in the US, but continued to be managed by NW Ayer & Son as the agency for Canada. The show was broadcast over CBC from New York, with a New York cast and the serial was distributed nationwide in the US, in Canada and made it across the ocean to Australia. The Australian series was broadcast on several stations across the country and began airing in October 1938. On most stations, it was heard 2 or 3 times per week. We believe, but do not know for certain, that the first season of the show was also aired. No surviving recordings have yet been found in Australia. Karl’s research showed that the show was broadcast live, twice for each of the 195-second season episodes. One broadcast was done at 6:15 to 6:30 p.m. for the East and a second one at 8:15 to 8:30 p.m. for the West Coast audience. The earlier broadcast was recorded, but if there were problems with it, another recording was made during the later broadcast. The commercials were not recorded, as Canadian audiences heard different promotional spots from those heard in the US. As mentioned in the prior section, there was a short third season of the show, broadcast in Canada to Canadian only stations. These shows were aired after the death of author Bill Moore, and probably were not all written by him. The shows were heard in Canada from July to November of 1939 and continued to feature actor William Janney in the title role, though it appears none of the other New York cast members made it across the border, instead being replaced by Canadian actors. We’re certain of who many of the actors were for the second season of the show, but haven’t found much information regarding the first Kellogg’s season cast. The only clue we have so far is a brief article that appeared in December 22, 1937 Radio Daily which mentions that Billie Rose, Audrey McGrath, Bill Bouchey and Hugh Studebaker were featured in Howie Wing, A Saga of Aviation. All of these actors were Chicago based, and we know that Billie Rose, Bill Bouchey and Audrey McGrath had worked with Bill Moore previously. Billie Rose and Bill Bouchey both were involved with The Air Adventures of Jimmie Allen, which Moore had co-authored with Robert Burtt. Audrey McGrath was featured in another lost radio show called Angels in Blue, which was about air stewardesses. While we’re sure that Audrey McGrath voiced the role of Howie’s girlfriend, Donna Cavendish, during this first Kellogg’s sponsored season, we’re not sure what roles the other actors played. In addition to the cast members noted above, Karl found documentation that indicate the character of Duke Dinsmore was played by Frank Dane, and Henry Saxe voiced character Baldy Calkins. More cast information is known for the second Kellogg’s season due to the availability of the scripts and other documentation from the archives at Duke University. We know that when the production moved to the New York studios William Janney became the voice of Howie. Though new to radio in 1938, Janney was no stranger to the acting profession. He came from a show business family. His father was the then well-known producer, Russell Janney, and Bill Janney had been ‘in the business’ since age 10. As a young man he made some 75 movies between 1929 and 1936. Bill Janney’s movie career was on the wane by the time Howie Wing came along. The problem may have been that Janney was almost always cast in juvenile or younger brother roles, and he was now getting a little too old to continue in that vein on the big screen. However, on radio his maturing appearance made no difference and his youthful voice was just right for Howie, the 21-year old flying cadet. 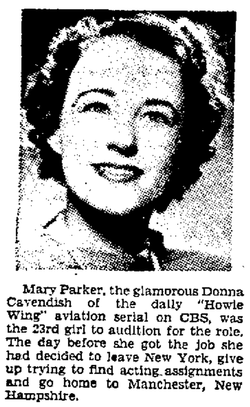 Mary Parker, the second season voice of Donna Cavendish, Howie’s gal pal, was more of a radio veteran, having been in radio for about a year. She played on such serials as Easy Aces and The Snow Village. Barbara Weeks was also in the role of Donna Cavendish, but we don’t know if she was a permanent replacement or a just temporarily filling in for Mary Parker. We do know that Mary was in the role through January 1939, and have found radio magazine blurbs that place Barbara as Donna in February and March 1939. Barbara appeared concurrently in another radio drama, Her Honor, Nancy James. Neill O’Malley played Captain Harvey, Howie’s mentor and Richard Bishop portrayed, “The Chief”. There was also a mechanic, Typhoon Tootel featured on the show that provided comic relief. In New York, Richard Strauss was to play the role of Typhoon Tootel, but professional obligations pulled him away for awhile, so, Floyd Buckley (radio’s Popeye) filled in for a few weeks, playing the role of Happy Vic Appleby until “Typhoon” returned. We also have notes that indicate William Steinke voiced Happy Vic Appleby, but not enough information yet to tell when that was. The scripts and other documentation in the Duke University archive listed quite a cadre of well-know New York based radio actors who appeared in Howie Wing during this second season, names such as: Bill Adams, Chet Stratton, Ed Lattimer, Bill Johnstone, Vicki Vola, Tom Tully, Jackie Kelf, Jack MacBryde, Frank Lovejoy, Ken Griffin, Alice Reinheart and Arthur Vinton. Howie Wing also featured many villains, along with some not-quite-so-bad guys who were put up to mischief by the villain, and usually saw the light by the end of the storyline. In season two, the most well known of the villains was Burton York, voiced by Raymond Bramley. His not-so-bad sidekick was Zero Smith, played by John Myer Griggs. Willfred Gibbs Moore, more familiarly known as Bill, was a rather amazing individual. He became a pilot during World War I, flying, in Europe, with the Royal Flying Corps during that conflict. After the war, and after being decorated by the British government for his service, Moore purchased his own plane and did some barnstorming. When he married in 1924, he hired on as a test pilot, and later the sales manager for an aircraft company. He and his wife settled, in Kansas City, Missouri where he remained involved with aviation and flying; he was a Captain in the Air Reserve and a race pilot of some repute. He was well known enough that he was featured on an advertisement for Independent Aviation Motor Oil. (Nov. 1929). Moore apparently also had a feel for media, and in 1931, when the aviation company closed it’s doors, Moore took a job at local radio station WDAF (Kansas City, Missouri) where he produced a sports review program. It was during this time that he met Don Davis, who later became Moore’s personal manager. While working at the station, he heard a fictional program having to do with pilots and flight. He found the program was full of inaccuracies about aviation and decided to write his own aviation serial. Moore then penned The Air Adventures of Jimmie Allen with collaborator and fellow pilot Robert Burtt. A few years later he also wrote, on his own, scripts for what would become Howie Wing, A Saga of Aviation. There are 4 scripts in the US Copyright Office that Moore sent there in 1936. Don Davis, who was president of WHB, a local independent radio station, had earlier taken a chance on Jimmie Allen, running it on his station, then later helped to sell it to a sponsor. In 1937, he did the same for Howie Wing, running it as a local serial first, then selling it – and Moore’s writing abilities - to Kellogg’s in December 1937. After the sale of his show to Kellogg’s, Moore moved his wife and children to the Chicago area where the show was being produced. Moore both wrote and produced Howie Wing, and kept close tabs on the show. Even though he stayed in Chicago when the show moved production to New York, he remained very hands-on, taking frequent flights to New York and staying in constant touch with the cast and crew. He used his own experiences as a wartime flyer, barnstormer and test pilot to make the shows authentic and exciting. He even scouted out the various locations for the show himself. In fact, at the time of his death, he had very recently returned from a location scouting run to Canada. We’ll never know where Moore’s talent may have taken him, but we know from the US copyright archives that Moore had many more scripts and shows written, and presumably would have penned many more. Those of us who are fans of the show sorely regret the stories that might have been told and that we’ll never hear. Kellogg’s purchased both the domestic (USA) rights and the international rights to Howie Wing to advertise it’s cereals. In the USA Kellogg’s solely advertised Corn Flakes; in Canada and Australia they advertised a variety of their cereals, including All-Wheat, Rice Crispies and Rice Bubbles. To build interest in their products, through the show, they produced a variety of premiums that young fans could send away for free or for purchase. Of course, each request for a give-away or paid premium had to be accompanied by Kellogg’s cereal box tops or the Kellogg’s red Circle K.
Surviving second season scripts, which fortunately include the commercials, reveal how Kellogg’s built up the excitement for the show and the product. Boys! Girls! Here’s your chance to join a real national aviation club! … wear the official Corps Wings of glistening chromium that only members can have! You’ll be in an outfit with thousands of other wide-awake, air-minded American boys and girls. And in an outfit with real flyers! Yes, many of the nation’s leading airmen belong to the Cadet Aviation Corps as Senior Pilots, so you can see that the club is the real thing! Wing Cadet Aviation Corps (and for Kellogg’s to collect valuable demographics!). Catching the kids attention and loyalty was effected by Captain Moore’s heart-pounding storylines, but Kellogg’s also needed to keep the youngsters tuned in to Corn Flakes and their other cereals. 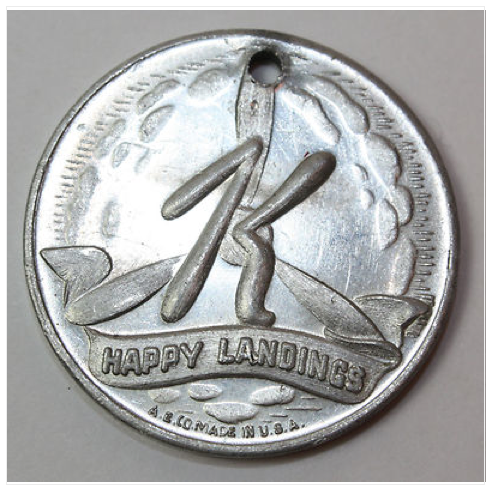 To that end, Kellogg’s offered other premiums, including a medallion, celluloid button, pilot goggles, a weather forecasting ring, Howie Wing T-shirts and various model airplanes. Kellogg’s also ran a series of on-air contests where kids won prizes for not too much effort. As noted to earlier, Kellogg’s sponsored one grand publicity stunt, around-the-world airplane race. This race was announced on the February 13, 1939 show, and was officially kicked off on the February 20th show. In 1939 an around-the-world flight was no common thing, so this was quite a major event. The two planes each carried a suitcase filled with prizes that would be awarded to one lucky boy and one lucky girl. And, these two suitcases would be the first items ever to be shipped around the globe by air express! Kellogg’s had certainly hit upon a thrilling and unique way to capture the kids' interest, and perhaps to get their parents to tune in, too. For the next several weeks, the announcer gave reports on where the suitcases were. He also reminds the youngsters to keep eating those crispy golden Corn Flakes, just like real flyers do. With the help of eBay and the generous assistance of an archivist at the Kellogg's Museum in Battle Creek Michigan, those of us involved in researching this show, have managed to either obtain, or, at least, see samples of some of the show premiums and Howie Wing give-aways. There is a Howie Wing Secret Message Decoder; a punch out and build your own Howie Wing Rubber Band Shooter gun, various Wings Over America box backs (on Corn Flakes) which feature drawings of ‘hot’ planes of the day, a map of the Canadian Lakes which allowed listeners to track the adventures of Howie and friends as they chased the bad guys across the landscape, a cardboard Ventriloquist’s Dummy, and a Howie Wing Moving Picture Machine, to name a handful. In Australia there was also a series of trading cards of various aircraft. Of course these, and all the items, included the easily recognized red Kellogg’s logo prominently displayed. In addition to on-air contests and premiums, Kellogg’s also sponsored special events at local airports in various locations, discounts at movie theaters and model building contests. They encouraged youngsters to start clubs with their friends to put together model airplanes, which, incidentally, the young fans could purchase from Kellogg’s. Their handbook features several such models, from simple balsa wood airplanes to those powered by small gasoline engines. Local newspapers in the USA, Canada and Australia carried promotions and information to entice the youngsters to become involved with the show. We found ads or articles that invite the youngsters to participate in the model building contests. 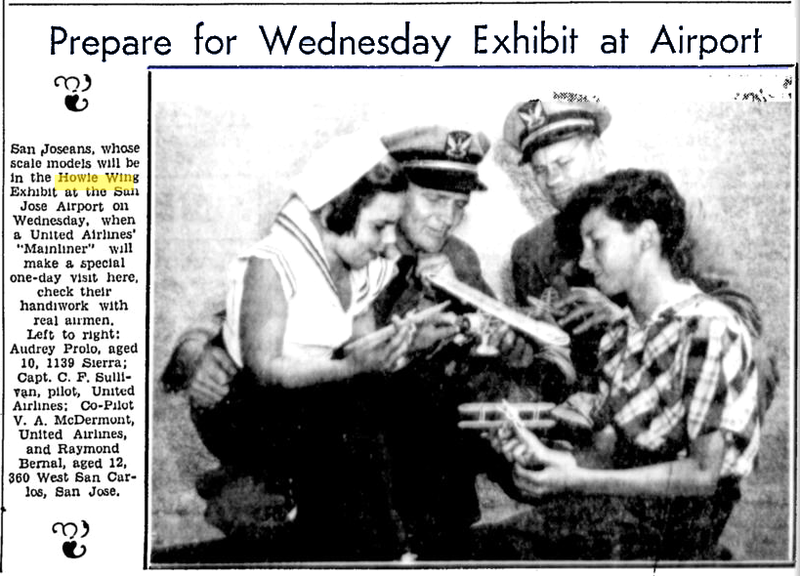 Models, certificates and trophies were awarded; pilots were enlisted for meet and greet sorts of affairs at local airports, and aviation displays were also arranged. During our research efforts we ran into online resources that indicated the show had an influence on youngsters that eventually made aviation their life’s work. A Canadian aviatrix, Phyllis Penney-Gaul, who was the first woman pilot in Newfoundland, said the Howie Wing show was responsible for her interest in flying. Another pilot wrote that when his plane went into a stall, he staved off panic by asking himself, “What would Howie Wing do?” He then remembered an episode where Howie pulled his plane out of a similar situation; the pilot used that remembered information to save himself and his aircraft. The show was authentic and considered educational. Author Bill Moore wrote about real situations that occurred for real flyers. Because he wanted the show to also be exciting, many of those situations illustrated the problems a pilot might run into. The pilot who pulled himself and his plane safely out of the stall credited Howie Wing for saving his life. Also in the course of our research, we found a couple of real live Howie Wing fans. A gentleman by the name of Joe Brown wrote to Ian, saying that he didn’t get his pilot’s license until many years after listening to the show as a youngster, but he still retained his original Kellogg’s Aviation Corps certificate and wings he’d sent away for when the show was on. Another one time fan, John Steel, told us he joined the Aviation Corps when he was 8 years old. The show engendered his life long interest in aviation. He said the show was very exciting at that time. John told us, “At the time Jean Batten, Amy Johnson, the Smith Brothers, Bert Hinkler, all Australian and English flying celebrities were much in the fore of the newspapers and magazines and it filtered down through the parents to the young children. My mother worked for the Smith Brothers. They were the successful UK - Australia flight winners. John also shared that the show struck a chord with young listeners for many reasons. Over the years since the initial discovery of the disks in that small vintage record shop in Sacramento, California, the team has amassed a considerable amount of information and artifacts. Through hard work, luck and vigilance we’ve found a lot of information about this once lost old radio show, and the search continues. In 2010 we found another two episodes of Howie Wing in an archive at the Wisconsin Historical Society. While these shows are not available for distribution, the archive is willing to make copies, for a fee, when requested. These two shows bring the number of surviving episodes to twelve, six of which are in circulation and two others from the short Canadian third season will be released once they’ve been digitized and cleaned. With additional archives coming on line almost daily, we still find new articles, images and information that wasn’t previously available. 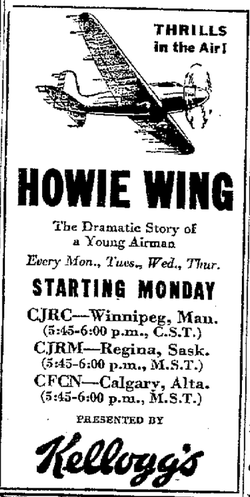 So, stand by for more news about Howie Wing, A Saga of Aviation. We’re confident we’ll have more to report as time goes on. A radio show doesn’t just spring full-grown out of an author’s head and on to the airwaves. A lot goes on between author’s concept and the first broadcast. In the course of his research, Karl Schadow put together the following tentative timeline of events. Note that this timeline starts about two years prior to the first known broadcast date for Howie Wing, A Saga Of Aviation! ca. 1936 - Howie Wing created by Willfred G. Moore (Four scripts deposited on Oct 29, 1936 in Copyright Office, Library of Congress). When these were actually written is currently unknown. It is unknown if Howie Wing was aired on WHB in 1936 or 1937, or on any other stations prior to the rights being purchased by Kellogg's. Dec 1937 - Kellogg's secures rights to Howie Wing. Production begins in Chicago. This is the transcribed (WBS) series, produced by N.W. Ayer & Son ad agency. This series does NOT star William Janney as Howie Wing. Summer 1938 - J. Walter Thompson takes over production of USA distribution. p.m. CBS did NOT air the WBS series. July 1939 - Canadian series begins with Janney as Howie, produced in Toronto, rest of cast unknown. Author, Willfred (Bill) G. Moore dies of a heart attack (July 14, 1939). information, some changes to this history may occur.